Which location in a finger is at greatest risk to experience an extensor tendon rupture? Typically, what leads to the rupture of the extensor tendon in this particular location? How does one identify a rupture of the extensor tendon above the distal interphalangeal joint? Can one be sure that a dangling distal phalanx on an otherwise stretchable finger means that the extensor tendon above the distal interphalangeal joint ruptured? What types of extensor tendon ruptures are there? How does one have to picture these two different types of extensor tendon ruptures? The most common location for extensor tendon ruptures is right above the distal interphalangeal joint of any digit, but also of the thumb. A rupture of the extensor tendon in this location almost always occurs without the appearance of external injuries. 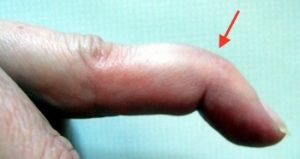 In most cases this type of rupture occurs when the stretched finger bumps into an object causing the stretched finger to abruptly bend back. A very common day-to-day activity which frequently leads to such injury is making the bed. If a sheet is tucked in too tight and the finger unexpectedly hits an obstacle, the aforementioned abrupt bending motion occurs, causing the extensor tendon to rip. It is important to be familiar with the anatomy of an extensor tendon (extensor aponeurosis) to understand an extensor tendon rupture above the distal interphalangeal joint of a digit or thumb. When we flex this tendon we simultaneously stretch the distal interphalangeal joint of the finger! The tendon will rip above the distal interphalangeal joint when the distal phalanx and respective joint are abruptly and severely bend. Along with making the beds which we already pointed out as frequent cause for this type of rupture, another common cause is the impact of a stretched finger with a ball. Therefore many times individuals practicing volleyball, basketball or similar sport activities are at great risk to experience extensor tendon ruptures above the distal interphalangeal joint. The image shows an extensor tendon which has surgically been exposed (removal of a thorn). Please note: The extensor tendon in a finger is not even 1 millimeter thick but it is rather broad. The patient most commonly notices a piercing pain at the time the incident occurs. 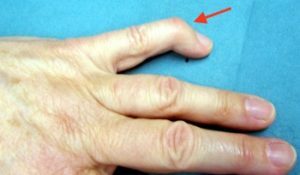 When examining the affected finger we first notice the dangling distal phalanx which can no longer actively be stretched. Only with the help of another digit the injured distal interphalangeal joint can be placed in a stretched-out position. However, it will not remain in that position but rather weakly fall back. When experiencing a rupture of the extensor tendon, the distal interphalangeal joint cannot be stretched without help. However, a passive stretch motion can be achieved with the use of another digit without any problem! A few minutes into the injury one may observe a swelling within the injured area, sometimes even a hematoma will appear. The injured area typically is very sensitive to the touch within the first hours after the accident occurred. Yes, there is practically no other injury which will lead to the described symptoms. It is however very important to determine what kind of extensor tendon rupture we are looking at when examining the dangling distal phalanx of the injured finger. The extensor tendon may rupture within the sinewy part above the distal interphalangeal joint. It may also rupture while at the same time tearing out bony fragments. Both variations of the extensor tendon rupture above the distal interphalangeal joint will most likely cause the same symptom, which is the inability to actively stretch out the distal phalanx of the affected digit. You may picture an extensor tendon like a rope. The rope pulls across the distal phalanx of a digit (red arrow) and is anchored in the bone of the distal phalanx (blue arrow), similar to a rope which is embedded into a wall. A rough external force will now cause this rope to rip. It is possible that the rope will tear in itself but in isolated cases it is equally possible that it will also tear out wall fragments of the wall in which it had been embedded. If you now apply this example to an extensor tendon rupture, here too the tendon may tear within the sinewy part above the distal interphalangeal joint but it may also tear out bone fragments when rupturing. A physician will refer to an extensor tendon rupture within the sinewy part as to an extensor aponeurosis rupture. The image to the left was taken during surgery on an extensor tendon rupture to the distal phalanx of a digit. The blue arrow points to the extensor tendon. The procedure was carried out to an open extensor tendon rupture. Sub-cutaneous lacerations to the extensor tendon typically do not require surgery. If a bone fragment is attached to the torn tendon we speak of an osseous extensor tendon rupture.